Babies and toddlers up to age 4 are welcome to Iris & Dora’s story time sessions, where we read a story and then paint a piece of pottery that relates to one of the characters. We feel that it’s very important to build creative expression at an early age, so just getting a paint brush in their tiny hands is the first step. 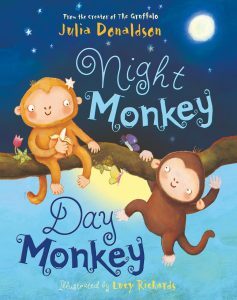 This week we will be reading Night Monkey, Day Monkey (if you have your own copy then feel free to bring it along), after which we will be painting monkeys. We will also be gluing and sticking monkey pictures. As usual, old clothes are recommended as some paints can stain.